VANCOUVER, British Columbia, Oct. 25, 2018 (GLOBE NEWSWIRE) -- Triumph Gold Corp., (TSX-V: TIG) (OTCMKTS: TIGCF) (“Triumph Gold” or the “Company”) is pleased to announce the purchase of a 2% Net Smelter Return (the “NSR”) interest in the Golden Revenue property, which is wholly contained within the Company’s 100% owned, road accessible Freegold Mountain Property, YT. With this purchase, a critical 9.9 sq. km portion of the Freegold Mountain property, centered over the Blue Sky-Revenue-Nucleus area, is now unencumbered by any royalties (Figure 1). RVD18-17 with 125.13 metres of 1.24 g/t Au, 7.0 g/t Ag, 0.31% Cu and 0.01% Mo (310.47 – 435.60m) contained within 202.10 metres of 0.87 g/t Au, 5.8 g/t Ag, 0.26% Cu and 0.01% Mo (287.00 – 489.10m) in the Blue Sky Zone. RVD18-03 with 72 metres of 0.54 g/t Au, 13.7 g/t Ag, 0.30% Cu and 0.01% Mo (60.00 – 132.00m) contained within 180 metres of 0.31 g/t Au, 5.7 g/t Ag, 0.16% Cu and 0.02% Mo (52.00 – 232.00m), in the WAu Breccia. RVD17-14 with 7 metres of 15.0 g/t Au (129 – 136m), in the Guder Zone. GRD08-099 with 9.36 metres of 70.19 g/t Au (109.64 – 119.00m) including 1.27 metres of 410.00 g/t Au (113.28 – 114.55m) at Nucleus. The purchase of this royalty reduces the NSR in most of the Nucleus - Revenue – Blue Sky area to zero percent. 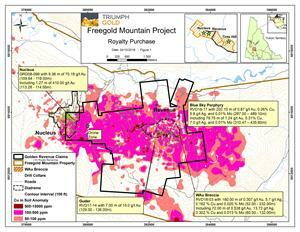 The remainder of the Freegold Mountain property has underlying NSR’s ranging from one to three percent, all of which may be bought down to one percent at any time.